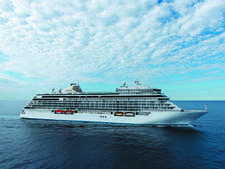 Regent lays claim to be the most inclusive experience among the major luxury cruise lines. Of course, such pampering doesn't come cheap but, once you're on the ship, the only things you have to put your hand in your pocket for are spa treatments, super-premium wines and spirits, splurges in the boutiques, puffing a Cohiba cigar and pitting your wits against Lady Luck in the casino. Everything else -- including flights, shore excursions, beverages and onboard gratuities -- is included in the price, so there are no unexpected hidden extras that might give you palpitations at the end of the trip. 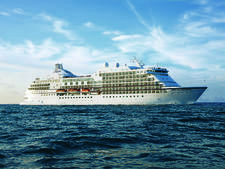 Seven Seas Voyager is a relaxing ship with a cultured but informal ambiance and a high crew-to-passenger ratio. Crew members are polite, proactive and pleasant; minimal announcements and a lack of queues enhance the feeling of refinement. With the ship's small passenger numbers and spacious public areas, you never feel crowded. You rarely have to stand in line or be frustrated with the wait for a drink. Though high fares mean passengers must be well-heeled to sail on Voyager, we found our fellow passengers to be surprisingly down-to-earth and friendly -- not the jet-setter types who flaunt their wealth. The fact that Voyager offers an all-inclusive experience enhances the onboard social scene, too, because it means there is no debate about whose round it is or an awkward moment at dinner deciding who pays for the wine. Drinks just keep on being poured, without anyone even having to ask. There is no class system onboard; everyone is treated the same, everyone has access to the same facilities and the same restaurants (though top suite classes have priority for multiple specialty restaurant reservations). Most passengers' first reaction when seeing Seven Seas Voyage at the dock is surprise that the ship is so big ("All that for just 700 passengers?!"). While Voyager has nine passenger decks, it's not as long from stem to stern as ships that carry more passengers, making it easy to get around without long treks down a corridor. An atrium stretches the height of all the passenger decks, bringing light to the ship's interior. Most onboard services are grouped here, making for easy access to the front desk, destinations desk, library, casino, shops and espresso bar. In warm weather, the action moves to the lido deck (Deck 11), home to the pool, a grill, a bar and the La Veranda buffet restaurant. At night, three lounges and a cigar bar offer different vibes, from mellow to lively. 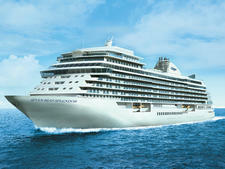 As you'd expect from a luxury ship, food and drink are abundant, with four restaurants, as well as 24-hour room service. The spa is by high-end provider Canyon Ranch. The spacious cabins are all ocean-facing, with balconies, and the ship carries a large number of even bigger (and very popular) premium suites. If you've cruised aboard Seven Seas Voyager before, you might not recognize the ship today. Voyager went into dry dock in November 2016, with the goal of bringing it up to the luxe standard of Regent's newest ship, Seven Seas Explorer. Now Voyager's public spaces are refitted with chic, contemporary furnishings, carpets, wall coverings and new lighting throughout. Cabins also underwent a thorough makeover, with updated upholstery, window treatments, carpeting and wall coverings. Expect a smorgasbord of nationalities, mainly well-educated, upscale folks. Fifty percent or more are typically repeat passengers. On our seven-night Mediterranean cruise, 29 different nationalities were onboard, including 356 U.S. and 167 U.K. passengers with a sprinkling of Canadians, Australians and Europeans -- mainly Danish, German and Belgian. As Regent originates from and is based in North America, passengers from this part of the world are usually in the majority. To some extent, of course, the variance of nationalities onboard also depends on where the ship is sailing, with more American passengers when the ship sails in Asia, for example. Regent reports that the average age is 60, but we found a mixed age group dominated by retirees. It's not unusual for grandparents to bring extended families on cruises, and the number of cruisers under 18 trends from virtually none on longer cruises during the school year to a larger number during vacation time and on shorter cruises. There were 50 young people onboard during our seven-night cruise in June. Until 6 p.m. each evening, a "country club casual" dress code applies, and shorts, jeans, deck shoes and tracksuits are all acceptable. Bare feet are only acceptable on the Pool Deck, and bathing suits are not allowed in the restaurants or lounges at any time -- though they can be worn at the Pool Grill and Bar. From 6 p.m. onward, an "elegant casual" dress code applies, with skirts, smart trousers or trouser suits with blouses or sweaters for women and collared shirts with optional sports jackets for men. Jeans aren't allowed in restaurants or lounges in the evenings. On cruises of 15 nights or longer, two evenings are "Formal Optional." On these nights, you can -- if you so desire -- dress to impress, with gowns or cocktail dresses for women, and tuxes, dinner jackets or dark suits with ties for men. On the final evening of the cruise, when everyone is busy packing to go home, the dress code sensibly is "relaxed casual." For United States passengers, flights to the embarkation city and home from the disembarkation city are included in the cruise fare. Flight segments within the U.S. may be coach, but international segments will be business class. If you want to designate your airline or routing, there's an additional fee. Beverages are also included, aside from a few ultra-premium liquors and high-end wines. A perfectly tasty Champagne flows freely, and your favorite call liquor brand likely is included, too. But if you opt for Veuve Clicquot, you'll pay extra. Each restaurant pours a selected red and a white wine nightly, but if those wines aren't to your taste, you can request alternatives. Passengers in Concierge-level suites or above receive an included hotel night and transfers prior to the cruise. Most shore excursions (90 percent, according to Regent) are included in your fare as well. These aren't simply bare-bones tours; some include experiences like biking, wine tastings and visits to museums. A handful of paid excursions offer higher-end experiences, including special instruction, gourmet meals or premium wine-tasting. In locations where the port is away from the city center, free shuttles are usually provided. 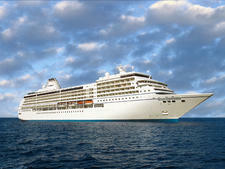 All Regent employee gratuities are included in the cruise fares. If you feel strongly about expressing gratitude to the crew, Regent encourages donations to the Crew Welfare Fund at the Purser's Office; this money funds crew parties and events. An 18 percent service charge is already included in spa prices, and the spa policy states, "Any additional gratuities for exceptional service are appreciated, but not expected." Shore-side gratuities are not included, however, so feel free to tip shore excursion guides and bus drivers if you're pleased with their services. The currency used onboard is the U.S. dollar. Reception offers currency exchange on some occasions -- from U.S. dollars to euros, for example.